Saturday, May 2, 2009, I go to buy some of detailing product, I want to complete the list of my consumer line detailing product so I can achieve the finest result of paint detailing. 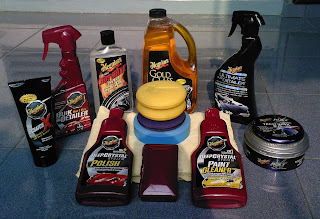 All of the product is Meguiar's consumer line. By the way, ScratchX that I buy is still the old one (not ScratchX 2.0) because is hasn't out right now in my country, still on shipping. And here it is, all of the product that I have right now. Last thing that I want is DeWalt DW849 Heavy-Duty 7"/9" Electronic Variable Speed Polisher.